I was looking at photos of people shooting, and I noticed the different ways people hold their guns when shooting. This got me thinking about how my own shooting stance has changed over time. Here is a brief history of my shooting stance. This is the classic one handed bullseye stance. 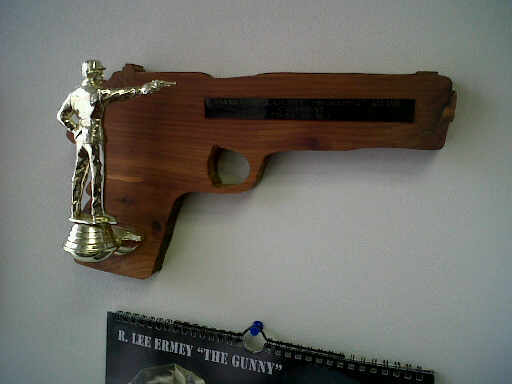 The shooter aims along the arm, and puts one hand in their pocket. I have no idea if this is still being done, but if I had to guess, it probably is, by bullseye competitors. I’ve played around with this stance on occasion, but I don’t have the arm stamina to do it effectively. However, if I did need to do it, I would just get some training and practice. The good news is I don’t have much reason to use this stance. I don’t shoot bullseye and I don’t settle quarrels with a duel. 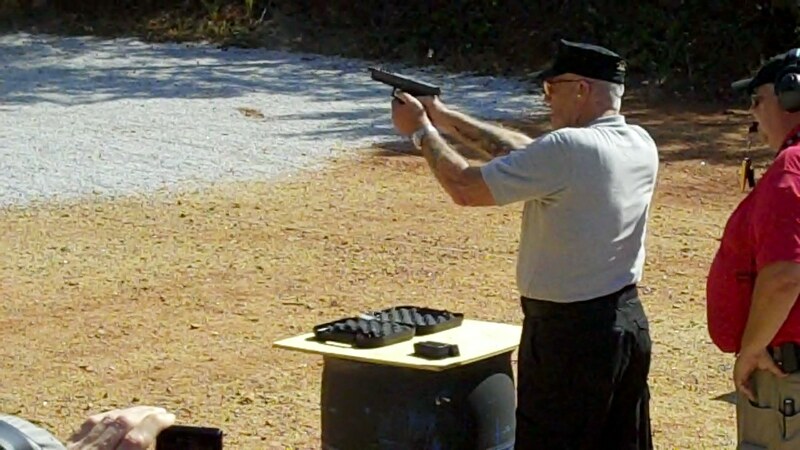 This stance was the major stance in use in the early days of Practical Pistol. A lot of more experienced shooters still use this stance. A lot of Hollywood people who don’t have a good instructor use this stance, some of them using the Teacup method with the support hand. R. Lee Ermey uses the Weaver stance. This is interesting, because the military taught a one-handed shooting style with the 1911, up until adoption of the Beretta M92 in the 1980’s. I used the Weaver stance early on, because it gave me a better view of the sights. The gun is closer to the eye. It also turns your body a little bit, which stabilizes you against the recoil. Proponents also say it presents a smaller target to the bad guy, but to me that assumes you are standing there shooting at a bad guy, and not running like hell to get away, like you should be. This stance is named for the triangle that the arms make when holding the gun in front of the shooter. It was pioneered by Brian Enos and Rob Leatham in the 80’s. I noticed that a lot of shooters used this stance, and I tried it a number of times. Some of them lock their elbows, like Dave Sevigny, and some leave the elbows a little bent, like Doug Koenig. I tried it both ways. But because it was uncomfortable to me – that is, unfamiliar – I quickly went back to the Weaver stance. On a couple of practice occasions, I decided to see how accurate I could be with each stance. I found out that I was a lot more accurate using the Isosceles stance than the Weaver, and I mean a lot more accurate. I think it has to do with the variability of the hold. In the Weaver I kept my strong arm a little bent, and I think this led to differences from shot to shot. After a few sessions, I finally convinced myself to switch to Isosceles. It wasn’t easy – no change ever is. But it’s paid off for me. Now, I occasionally find myself back in the Weaver stance, for no apparent reason. Habit I guess. My point of all this is to say, try all the stances. 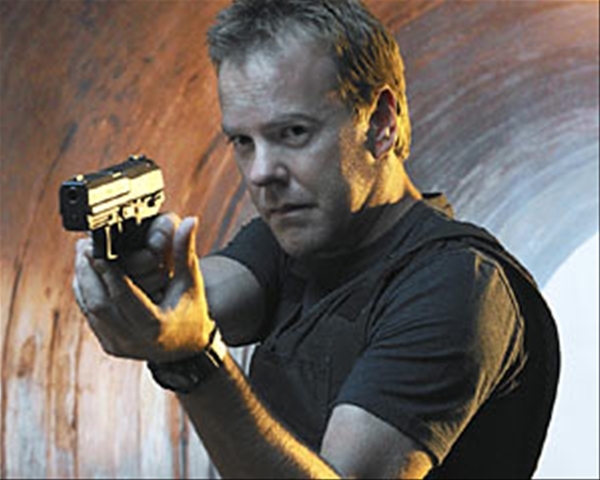 Don’t use a stance just because you think it looks good on Jack Bauer. Use what works. And if people give you grief, let your score do the talking. Good thinking! I've used all three, but, predominantly Weaver. I'm too old to change now – and it works. There is another lesser used stance, mostly for close range shooting (helpful indoors). The Center Axis Relock stance. You can look up examples of it on youtube, one guy who has some good ones is SafeArmsReview.Wiki also has some info on it. You can keep both eyes open, and you keep the gun closer to your eyes that usual. Just be careful though, first time I tried it, having the slide that close to my face scared the bejeesus out of me. Guffaw:I have to admit changing stance was the hardest thing I've had to learn in sports, right up there with changing my golf grip. But given the improvement in my shooting, it's been worth it. YMMV.Jordan: I will check out the CAR stance. Thanks. BTW I shoot everything with both eyes open, even rifles. Just how I learned. I'm going to have to practice a bit more, but everyone at the range would think I'm crazy, as most of them are uneducated about firearms. CAR can also be used close to the body near the chest or waist. Very versatile.I'm going to have to try shooting more without closing an eye, it may be a challenge. I'm a Weaver advocate too. I think it's the most comfortable stance in target and combat shooting. Keeping your legs apart and slightly bent will give your the much-needed stability – in combat you just have to drop to one knee to give yourself a lower profile. With a Weaver, you can easily make a double tap on the central mass and reload quickly without taking your eyes off the target.